2 or more: $170.99 ea. KitchenAid Gourmet Essentials 10-piece cookware set includes a 1-, 2- and 3-quart covered saucepan, an 8-quart covered stockpot, and an 8- and 10-inch open French skillet. 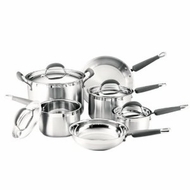 Product is made from the world's best 18/10 stainless steel to provide exceptional luster and durability. The brushed stainless steel exterior provides a professional look and easy to maintain surface. The base is constructed of a stainless steel base that fully encapsulates an aluminum disk. This provides excellent heat distribution and no hot spots. The cool grip handles are stainless steel shafts with silicone rubber inserts that are oven safe up to 400 degrees.